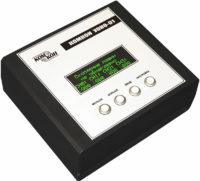 Vehciles queue monitoring device KOMKON UONO is intended for implementation of simple dynamic algorithms based on the queue length with obsolete controllers. Algorithm is performed by detection of presence of the vehicles queue with length that exceeds the defined limit at any of the directions of the X-cross. Queue presence analysis is performed through zone occupation time calculation. Occupation is controlled by traffic detectors, installed on the each direction of the crossroad. Queu detection is performed continuously, also each direction has own priority level. In case of vehicles queue presence the device produces a signal. In case of queue absence controller switches back to the daily program. If the queue is still there, but the signal with higher priority appears, controller switches to the program with higher priority.